AM Storm Update – Here Comes the Snow! We’ve been pretty quiet on the details regarding our next storm system throughout this week… that should probably tell you how excited we are getting about it. The fact is the next storm system has a ton of moisture in it, the mountains are going to see very high amounts of accumulated snowfall the next few days, but sadly the storm track and setup is not conducive to a decent snow event along the front range. The Euro is only slightly more excited about the Palmer Divide, but still holds many places outside of that region (along the front range) at nearly no snow accumulation. For the record, the EURO has been most accurate this year, it’s showing about 1 inch for the Castle Rock area and amounts close to that around the city in areas with higher elevations. There are no winter weather alerts with this storm for the Palmer Divide region… at this point we don’t expect any to be issued. **Emphasis on the lower amounts of these ranges with the data coming in today! 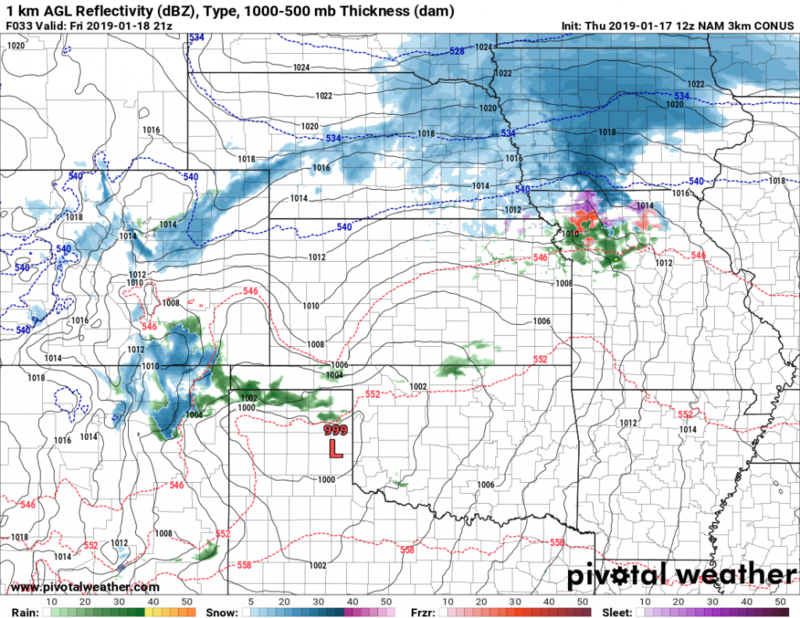 2PM Nam3k composite radar forecast for Friday. This is the only burst of snow I see that comes when the cold front moves through. The model has it completely gone by the 5PM snapshot… so a very quick duration event! Expecting little to minor impacts with this storm. Some roads may become a bit slick with the quick burst of snow when the front arrives on Friday afternoon. Given the quickness that the front moves through and exits the area, we don’t expect any widespread issues and the duration of snowfall looks short. Should this look like it’s changing, we will pass along those details!